Is it snowing in Hochjoch-Schruns ?Thank you! The snow forecast for Hochjoch-Schruns is: Heavy rain (total 42.0mm), heaviest during Fri afternoon. Freeze-thaw conditions (max 10°C on Fri morning, min 0°C on Sun night). Wind will be generally light. Hochjoch-Schruns Weather (Next 3 days): The snow forecast for Hochjoch-Schruns is: Heavy rain (total 42.0mm), heaviest during Fri afternoon. Freeze-thaw conditions (max 10°C on Fri morning, min 0°C on Sun night). Wind will be generally light. Hochjoch-Schruns Weather (Days 4-6): Moderate rain (total 11.0mm), heaviest on Mon afternoon. Very mild (max 13°C on Wed afternoon, min 3°C on Mon morning). Wind will be generally light. Moderate rain (total 11.0mm), heaviest on Mon afternoon. Very mild (max 13°C on Wed afternoon, min 3°C on Mon morning). Wind will be generally light. Heavy rain (total 42.0mm), heaviest during Fri afternoon. Freeze-thaw conditions (max 10°C on Fri morning, min 0°C on Sun night). Wind will be generally light. The above table gives the weather forecast for Hochjoch-Schruns at the specific elevation of 700 m. Our sophisticated weather models allow us to provide snow forecasts for the top, middle and bottom ski stations of Hochjoch-Schruns. To access the weather forecasts for the other elevations, use the tab navigation above the table. For a wider view of the weather, check out the Weather Map of Austria. I am reluctant to write this as so few English people visit Schruns - and don't know what they are missing. Staying in Schruns gives access to not only the Hochjoch ski area, but also Golm, Sankt Gallenkirch and Gargellen - probably more than the 3 valleys in France, but is easy to reach - the first valley (Montafon) in Austria, its high so you can ski till after Easter, and its so beautiful. 10 years ago, we heard the Austrian and Germans in the lift queue refer to the English family but now there are more than just us. And don't take notice of the report above - there is a lot of off piste and extreme skiing from Kreuzjoch - its been on Extreme Ski TV programmes and there are great guides to take you around. we have skied all over - 3 valleys, St Anton (which is an easy journey from here) Val D'Isere etc but nowhere matches the Montafon valley. Plus stay in one of the many lovely houses - our favourite is Haus Kasimir. 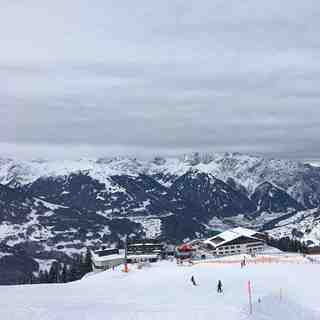 The Hochjoch-Schruns skiing weather widget below is available to embed on external websites free of charge. It provides a daily summary of our Hochjoch-Schruns snow forecast and current weather conditions. Simply go to the feed configuration page and follow the 3 simple steps to grab the custom html code snippet and paste it into your own site. You can choose the snow forecast elevation (summit, mid-mountain or bottom lift) and metric/imperial units for the snow forecast feed to suit your own website…. Click here to get the code.